The name Jeremiah means “exalted of the Lord” or “appointed by the Lord.” Jeremiah prophesied during the reigns of the final five kings of Judah: Josiah, Jehoahaz, Jehoiakim, Jehoiachin, Zedekiah. He was called to be a prophet at an early age (Jer. 1:6). In 586 BC, Jeremiah witnessed the destruction of the temple and the city (Jer. 39:2-8). Nebuchadnezzar killed King Zedekiah’s sons, put out the king’s eyes, and carried him captive to Babylon. Jeremiah was released from prison by the Babylonians and chose to remain with the remnant of Jews who stayed in the land (Jer. 39:13-14). When the remnant refused to obey God’s Word that they remain in the land and determined, instead, to go to Egypt, Jeremiah accompanied them (Jer. 43:1-7). In Egypt, he disappears from history. The book of Jeremiah has countless applications, but a major one is to the preaching of God’s Word in end-time apostasy. 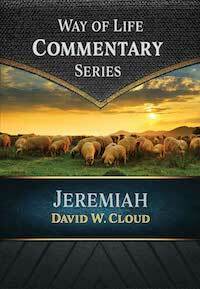 This series is designed in a unique format to be used as commentaries, as teaching courses, and for expository preaching. The commentaries are thorough, serious, broad, insightful, and practical, with an emphasis on application to the Christian life and ministry. Context is honored; words are defined; metaphors are explained; difficulties are tackled. The commentaries are packed with historical backgrounds and archaeological studies based on the author’s personal research, which is reflected in books such as Bible Times and Ancient Kingdoms and Jews in Fighter Jets. The interpretation is from a literal, dispensational perspective, and the King James Bible is explained but not criticized. There is no hint of modernism nor influence from compromised evangelicalism. The user will find no reference to or dependence upon men such as Origen, Jerome, Augustine, C.S. Lewis, Eberhard Nestle, or Bruce Metzger. Book: Softcover, 271 pages, 5.5 x 8.5 in. eBook: PDF, Mobi (Kindle), and ePub formats.